Review Summary: Essential – just like the record itself. For only being released in 2015, I’ve already formed an intimate connection with Carrie & Lowell. The record arrived at a crossroads in my personal life, when an unforeseen career shift meant working twelve hour night shifts, pacing up and down the dim halls of a massive data center completely alone. Months went by of me getting used to the monotonous hum of servers, the buzzing of fans, and the gentle glow of green-tinged lights as an ambiance to the thoughts rattling around inside my head. When Carrie & Lowell arrived, it became the ideal accompaniment to my nightly excursions: quiet and focused, the devastating human emotions playing back like an ironic backdrop against all of the buzzing machines around me. It became the soundtrack to what my life had become – sleeping days, working nights, and pretty much always being alone. Carrie & Lowell went on to carry even greater weight when my grandfather, after battling with Alzheimer’s for half a decade, passed away suddenly on the morning of my wedding. Each step of the way, this album was there. As Stevens grappled with the death of his estranged mother, I reflected on the existence of one of the most influential people in my own life. In many ways the stars were aligned, and a part of me will always be tied to Carrie & Lowell for that reason. It’s been approximately two years, but every note of this album rings out with just as much clarity as it did the first time around. To be honest, a live reworking of the experience made me a little apprehensive. Would it pack the same emotion" Would it evoke similar memories – or worse yet – alter the deeply personal associations I had already formed with each track" It felt like a risk to even hear Carrie & Lowell Live, which may sound ridiculous, but it makes sense if you can relate it to something in your own life that you essentially view as perfect. The beautiful thing about Sufjan Stevens is that he’s been around long enough now to know exactly how to translate his records into a live setting. Nothing is totally foreign, but at the same time enough has changed that it’s worth investing separate listens into. His vocals sound warm and nearby, like he’s recounting the story of his mother’s passing to a group of close friends with two years of perspective under his belt. 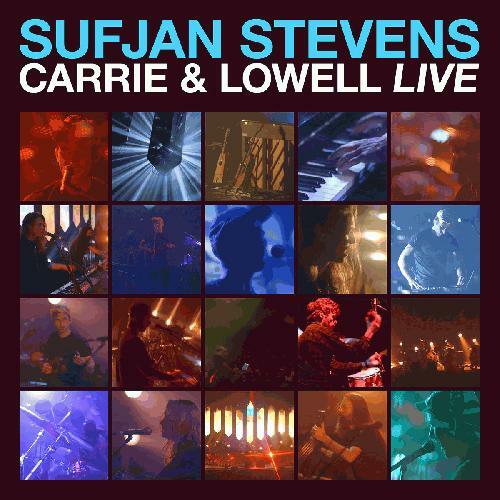 If you sunk your ears into Carrie & Lowell and felt it was one of Sufjan’s best works to date, then this live translation will likely find you feeling equally as impressed, and perhaps even more devastated by the sheer proximity of it all. This is not an obligatory recounting of his most recent success; Carrie & Lowell Live is an essential component for any dedicated Sufjan fan. The experience kicks off with “Redford (For Yia-Yia and Pappou)”, a track that while originally from 2003’s Michigan, finds itself fitting here not only as an instrumentally melancholic expression, but also as the familial Greek translation meaning “Grandma and Grandpa.” Applause can be heard at the first recognition of the opening chords to “Death With Dignity”, one of the record’s most recognizable tunes for its acoustic atmosphere and Stevens’ mesmerizing quotes of “I forgive you mother” and “I don't know where to begin.” As on the entire live recording, Sufjan’s vocals carry devastating emotional weight and are always on point here, while receiving a slight boost from female backing vocals that were not present on the standard LP. It’s not only an excellent way to kick off Carrie & Lowell Live, but also a fair barometer of what to expect experimentally from Stevens on this live re-imagining. Most songs here have one or two primary hooks that differ from the original, accompanied by a series of more subtle twists that will reveal themselves upon repeated listens (and perhaps more quickly to those who know C&L inside-out). “Should Have Known Better” may illustrate Stevens’ best overall reconfiguration; the track retains its hollow, haunting aura while Sufjan’s vocals come in sounding ever-so-slightly more powerful and convicted. It culminates in a borderline rock outro comprised of relatively heavy percussion and a series of electronic undercurrents that foreshadow the inclusion of some Age of Adz moments towards the back end of the live show. Its follow-up offering, “All Of Me Wants All Of You”, easily stands out as the emotional pinnacle of the entire experience: the first chorus soars atop Stevens’ heightened, emotionally shattered vocals and apparition-like backing oohs from his accompanying choir. The list of affecting moments on Carrie & Lowell Live is a mirror reflection of its tracklist, so it’s best to just grab a box of issues and settle in for the long haul. Without recounting every track, most of the highlights here come from Stevens’ willingness to tinker with perfection; not every live track is as haunting as its corresponding original, but he never fails to deliver that authentic live experience. Meaningless applause and background noise is edited down to a minimum, giving it this vibe of being an intimate, small-attendance concert where you can hear the occasional cracks in his voice as the guitars bounce around and echo off the walls. This may never be more apparent than it is on the gut-wrenching one-two punch of “The Only Thing” and “Fourth of July” – quite possibly the two most impactful songs from Carrie & Lowell. They hold up quite admirably here on account of retaining their stripped-down foundations while focusing on the cathartic lyrics. You can hear Stevens’ vocals surge at certain points, and it’s easy to imagine that a tear slips out when he recalls lines such as “Did you get enough love, my little dove…Why do you cry"” or “Everything I see returns to you somehow.” As I mentioned before, Sufjan is a master of live translation, and on this recording he makes all of the right choices regarding when to liven things up and when to pull in the reins. It’s a fine line that he walks effortlessly. This live experience is perhaps at its most unique and intriguing as the curtains begin to pull closed, featuring Age of Adz inclusions “Futile Devices” and “Vesuvius” (the latter of which is adapted to fit in surprisingly well with the somber mood), along with an eighteen minute adaptation of “Blue Bucket of Gold” – split into a five and a half minute vocal cut and a twelve and a half minute instrumental outro. For being an entirely acoustic album centered around a largely homogenous and disconsolate atmosphere, there’s really never a dull moment to be had. Stevens even resurfaces after “Blue Bucket of Gold” for an encore – a cover of Drake’s “Hotline Bling” that features a guest appearance from R&B solo artist Gallant. Carrie & Lowell Live manages to make itself accessible to listeners who bemoaned the original LP’s lack of variety and flair, and all without betraying diehards such as me who swear that C&L is one of the best albums of the last decade. I feel even more connected to Sufjan Stevens and his music having heard this, and it’s difficult to imagine this live effort doing anything other than bolstering support for his artistry – regardless of the particular career juncture that you personally view as his best. Carrie & Lowell Live is monumental, and it’s essential – just like the record itself. Wasn't that compelled to check the original out, great review Sowing. Are you sticking around now then? Fantastic review. I remember a couple years back when I went to see him perform Carrie and Lowell in Detroit. It was just shortly after my mother's passing and it was a very emotional experience for me. The live version of blue bucket of gold was mind blowing. Perhaps just a tad too long, but what a climax. "Are you sticking around now then?" Ha yeah. I jumped the gun a year ago when I said I was out - some things changed and it looks like I'm never leaving! Yay? "I remember a couple years back when I went to see him perform Carrie and Lowell in Detroit. It was just shortly after my mother's passing"
I remember talking about that with you on the site and FB - this album definitely captures that essence of having your emotional core ripped out. This sounds cool but I don't feel like I particularly need it in my life; Carrie and Lowell is pretty close to perfect on its own and this seems overly long to boot. Glad to hear that man it wouldn't be the same without you. Let's be honest sputnik is like a cult, once you're in you can never really leave. It's a nice alternative perspective I guess but the arrangements don't work at all with the lyrics. "We're all gonna die" sung over an upbeat, noisy music in the ending of "Fourth of July" is hilarious. "Glad to hear that man it wouldn't be the same without you. Let's be honest sputnik is like a cult, once you're in you can never really leave." That's too nice, but I appreciate the sentiment for sure. And you're absolutely right about not being able to leave. I intended on leaving after getting engaged in 2013, but returned when I discovered that my life didn't really change that much. Then the same thing happened last year with buying a house, I made plans to bow out with one last Yellowcard review then changed my mind like a week or two later...haha. "It's a nice alternative perspective I guess but the arrangements don't work at all with the lyrics. "We're all gonna die" sung over an upbeat, noisy music in the ending of "Fourth of July" is hilarious." To each his own, surely, but I enjoyed the majority of the re-workings on here. Sput is a damn cult, spend more time than I can justify here. I don't think I could see myself successfully leaving intentionally, but I do think I will eventually gradually fade out of commenting here. "Carrie & Lowell went on to carry even greater weight when my grandfather, after battling with Alzheimer’s for half a decade, passed away suddenly on the morning of my wedding"
@ashcrash: that seems to be a shared story amongst many who love the album; it's objectively a superb record almost no matter how you look at it but when you factor in the emotional weight of being able to relate it's an easy "classic." @rowan: I doubt this can live up to being there in person, but I imagine it's the next best thing. If you enjoyed C&L and like Sufjan live, then this can't be too disappointing. Think I'm going to skip this one. The studio version was good, but somehow unpleasant. Like visiting a friend in the hospital -- something you need to do, not something you look forward to. Niiice, happy bday! It would be hard to beat having something like this come out on my birthday. @Divaman: I can understand that. Listening to this record isn't exactly a "happy" experience.